H.A.L.F.The MakersBy: Natalie WrightNarrated by: Dylan WhiteThis audible book seemed to half a theme of escape...some of our heroes were on the space ship and trying to escape, some were on Earth trying to help others escape, and it was so exciting! There was never a dull moment. I loved that there were evil aliens and nice aliens. Same with people. What we thought we knew in book one, not all of it was right, or partly right. There are more we find out. It is such a fun, fast exciting read. The narrator was the same as book one which made it easy to continue the series without learning new voices. Perfect narration, and it couldn't have been easy doing wheezy aliens either! lolThis is one terrific series! Even though I really liked The Deep Beneath, I ran out of steam on The Makers about halfway through. It’s not that it was a bad book (it really isn’t), but it does suffer from a little bit of sequel-itis. I did finish the book, but it was a conscious effort on my part to do so, rather than any particular drive to continue the story. Now, keep in mind though, I’m an atypical case because I don’t really like reading series. I prefer to stop at the first book 90% of the time, and it takes (generally) a lot of sarcasm, action, and monsters to keep me reading. Given the nature of The Makers, it only hit about, pardon the pun, half the marks for me to stay interested. The Makers splits its time between two of the main characters from The Deep Beneath. They’re in entirely different, albeit both very deadly, situations. Jack’s situation is fairly straightforward action-thriller. Erika’s is the one that stays decidedly in the sci-fi zone. I never thought that I would actually change my view on some of the characters from the first book, but I definitely did. My views on Jack and Ian changed rather drastically, as they did for one other person that played a pivotal role in the first book. I mean, don’t get me wrong, that person is still a Grade A douche bag, but, considering the circumstances… Well, let’s just say that I can respect what they’re trying to do even while I still want to slap them silly. In regards to the alien’s weakness from the first book, I was definitely caught off guard by a revelation in The Makers. It does make me want to read the third book just to see exactly how she’s going to tie the two things together. Because right now it doesn’t really seem to make a lot of sense.And, of course, there’s the true threat referenced in the synopsis. I’m not sure how I feel about this particular threat. I will say that I appreciate the idea of the krindor, though! I would love to see an illustration of this particular threat in action. The author has a solid imagination and even though I’m not exactly on the edge of my seat, I can still admit to liking the sandbox she’s created so far.The pacing in The Makers was a bit better than in the first. The dialogue, descriptions, etc, are all consistently well-done. There were a few lines in here that I particularly appreciated for the truths that they were. (Especially the one about looking like a model and acting with balls of steel.) Hopefully the third book, H.A.L.F. Origins, finishes everything off in a satisfying manner. We shall see!Disclaimer: I received a copy of this book from the author for review consideration. I hadn't read anything by this author previously, but I loved the look of this book. When I got it to review, I had a look at what people had to say, and made the wise decision to grab book one, and start from the beginning. I am so glad I did, as this story really deserves to be read from start to finish. It is exciting, well-written and very easy to get stuck into. I liked the attention to detail, right down to creating a world, along with unique characters and language. I have always loved this in a good science fiction or fantasy read, possibly because my first love was The Hobbit and LOTR. However, there is always the chance that this won't be done well and it can ruin a good read. The author has taken the time and effort to really create a unique world and fill in all the details to make it a true world,you can submerge yourself in, as you read. The characters are full of depth and personality, really giving them a life of there own. I liked this and the fact that the author,in both book one and this book, continues to have the characters evolve and grow into something more. This really makes it feel as though you are I the story, getting to know them. The pace is really good.i. Found it kept me connected and excited for the read. I always felt as though I was flowing along, really enjoy the story. Overall,this was a brilliant book. I truly enjoyed it and look forward to reading more from this author. **I received this book for free in exchange for my honest and unbiased opinion. I was blessed with a free copy of this book, and have chosen of my own volition to share this review with you!The saga continues with H.A.L.F. 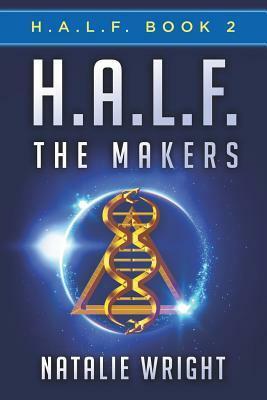 : The Makers, the second book in the H.A.L.F. trilogy. This book is better than the first book. Continuing where the story left off in the first book. Almost like a continuation of the same book (seamless transition). The characters are complexly developed. The story line continues to twist and turn. I was a bit confused about the timeline, but it all makes sense at the end! Where I felt the first book was similar to many alien stories, this one was more impressive. Sure there are some spots that are common, but the story here feels to move to a new level. There are interesting connections between where Erika, Ian, Dr. Randell, and Tex go to with the aliens and where we've been. Very interesting!I feel this book has more emotion and depth to the characters than the first story. Living through these hard times and fighting to live and return home or save others has brought them all to a new level. ****FULL REVIEW*****This audiobook was provided by the author, narrator, or publisher at no cost in exchange for an unbiased review at my request.Erika, Tex, Ian, and Dr. Randall are pulled through the light to the alien ship, or so they think is a ship. But things are as Tex suspected from what he'd heard. There is more and they need to survive and get home to help save the world. Jack was rejected by the light and facing the changes at A.H.D.N.A. Changes that are not good for the world. Jack must work with those he doesn't know to break out the one person that recently threatened his life, Commander Sturgis. She holds knowledge that is going to be needed in what's to come.Dylan White is a new voice for me. He does well with different voice tones and personality to share the feel of the characters as they speak. I did find that the volume, in which the recording was done, was very quiet. I had to turn this book up louder than many of my other audio books to hear all the words that were spoken. But I enjoyed the story that Dylan voiced for us.We start exactly where the first book ends. Our characters moving on with the unknown that's about to happen to them.POV is through a few different eyes: Erika, Commander Sturgis, Jack, Tex, and U'Vol. All are at different places and witnessing or experiencing different things in the world. Erika is taken with Ian, Dr. Randell, and Tex by the aliens. However, Tex is separated from them. Jack was rejected in the taking, and is left on land with Commander Lillian Sturgis, but Commander Sturgis is arrested and none know Jack is there. U'Vol is a new character for us, an alien of a different world. I have a feeling U'Vol will become more important in the next book, especially after the last chapter with him in this book.Each character has an important rule to play in this book. Erika sees the side of what's being done to her and her friends and works to escape where they are. Tex is wanted by the aliens, Conexus, because of how he was created and could help them. He also gives us the view of what's happened and what the Conexus is and wants. Commander Sturgis only has a few sections, but she knows there is trouble coming and will do anything to protect the world, and her knowledge is needed. Jack is on Earth and working with new characters to save the one person he didn't think he'd ever want to see again, then to save the world. Then there is U'Vol. I won't say much of him as he's new and an interesting view into things to happen.Where I felt the first book was similar to many alien stories, this one was more impressive. Sure there are some spots that are common, but the story here feels to move to a new level. There are interesting connections between where Erika, Ian, Dr. Randell, and Tex go to with the aliens and where we've been. Very interesting!I can see small sparks of love starting through the story. The couple we originally thought would be together, could grow to learn they love others, finding the one that may fit. Or maybe not. I'm not sure how the love angle will work out in this series. They are still young after all.The writing felt to ring home much better with me in this book. I really like the description as the story starts in Erika's POV. Wow. Well done. I feel this book has more emotion and depth to the characters than the first story. Living through these hard times and fighting to live and return home or save others has brought them all to a new level. This book felt more invested and better written to me.The ending concludes the troubles the characters are in with this book. But, it doesn't bring us completely to an end and there are new complications to face. We will be waiting for book three to see where we end up and what happens next! Erika, Ian, Tex and Dr. Randall have been taken by the Greys. This is how they named the aliens. On earth they were in the fight of their lives. The scientist Dr. Sturgis saw them as a threat and gave the order to kill them all. Now Erika, Ian, Tex and Dr. Randall are in for a new fight. The Greys gave them only one option, serve them or die.Erika and Ian are teenagers. They wanted to escape earth together with Erika's boyfriend Jack. The Greys left him behind. Erika and Ian don't understand why they did that. What Erika and Ian do know is that they both don't have any interest in serving the Greys for the rest of their lives.Dr. Randall is a genius scientist. He and Dr. Sturgiss are the only ones who know how to make a hybrid. Tex is one of the hybrids and he is the only one who can communicate with the Greys. If Tex would join the Greys he'll become the robot he actually is. All of his emotions will be shut down. Dr. Randall will stop at nothing to keep that from happening and together with Erika and Ian he is looking for a way out.Jake was left behind on the battlefield they wanted to escape. Instead of being killed he finds help from an unexpected person. Jake hates Dr. Sturgiss because she ordered their deaths but the only way to be free again has to be through Dr. Sturgiss. Jake is brought to Anna. Anna is Dr. Sturgiss's niece. Together with her Jake has to find a way to get Dr. Sturgiss out of prison. When the walls are closing in from every side, helping someone escape and managing to stay alive has never been this hard.H.A.L.F. : The Makers begins right in the middle of a battle that has gone wrong. You'll start on the edge of your seat because of that. It's a fast-paced story with a lot of twists and turns. Natalie Wright doesn't shy away from graphic scenes and will fill your head with the images she created for her story. Before you start reading Natalie Wright made a list for you with all the names of the aliens and the places in the story, this way you don't have to figure it out all by yourself. It's really easy to connect to the story because you already know how everything is put together.I usually don't read books about aliens, but every once in a while a story calls out to me. H.A.L.F. : The Makers made me step out of my comfort zone and I'm really glad that I did. This story makes me interested in the genre again. I loved H.A.L.F. : The Makers from start till finish. To fully comprehend all that has happened and to understand what the main characters are dealing with in the second book I do recommend that you start with book one. ARC from the author kindly provided for an honest reviewA worthy sequel to the book I liked very much, so make sure you read The Deep Beneath first (https://www.goodreads.com/book/show/2...).I was gripped from the start, and the characters I came to know and love in part one continued to grow on me. A few worthy additions too! And again the end sets you up for the next installment...Do not be put off by a 'dictionary' at the start (I was somewhat taken aback when I started reading, I enjoy sci-fi but not the sort that requires a new vocabulary! ), as it rerally only applies to two chapters. The first one comes about halfway through the book - and, frankly, I did not feel that chapter added anything when I got to it. It does come into play again in the epilogue, setting the scene for the next adventure, though to me the initial placement of U'Vol introduction still feels odd.Overall, thoroughly enjoyable read. Give it a shot! H.A.L.F The Makers is Book Two in a trilogy from Natalie Wright. Aimed at the young adult market, this science fiction based genre sees Erika and her group of friends/colleagues captured and imprisoned by a species known as ‘The Greys.’ Waiting to find out their fate, they have no idea of why they were taken and why one of their group’s members was left behind. The Greys have a surrender or die mantra, and the group must do whatever is needed to survive. Friendship and loyalty will be tested, but none of them are prepared for the danger that awaits them.Whilst sci-fi is not my preferred genre, I was genuinely impressed at the extensive storyline in H.A.L.F The Makers Book Two, and I can thoroughly appreciate Natalie’s craft and passion for the written word. The excitement of the story, and indeed the likeable characters, she has created is immense and so obvious throughout this book.Beginning with an intense opening scene, the reader is dragged onto an unknown alien spaceship, and kept in the dark with each of the hostages as the chilling action begins. Erika is the first character Natalie introduces us to and, for me personally, she remains the strongest and most captivating character throughout.What is most impressive, and indeed surprising for such a genre, is the detailing of the intricate relationships between the characters in this second book. Each character is developed further in a series of smaller chapters varying between Erika, Sturgis, Jack and Tex. And, although the story is action packed, we still have enough time to get to know the personalities of each character and their connection, which makes for an all-round read. Considering this is the second book in the series, and I haven’t read any of the first book, this only serves to highlight what good characterisation skills Natalie possesses!I was somewhat surprised to find that the H.A.L.F series is aimed at young adults because I would thoroughly recommend it for adult readers; particularly those who aren’t quite sci-fi fans but would like to get into this genre. Whilst it is indeed sci-fi based, with selective sci-fi speak to accompany it, it is an accessible read with enough description and in-depth story to keep a non-sci-fi reader hooked. That’s not to say that the book is gentle, for Natalie certainly doesn’t shy away from the more graphic of scenes. But at the same time, she doesn’t try to dilute or water down the story and the result is a fluid and extremely compelling narrative.The addition of a pronunciation and definition guide right at the beginning of this book was a little off-putting, and left me wondering what I was getting myself into, but in all honesty, there isn’t a need to keep referring back and forth to the guide for clarity and it merely serves as a useful addition, should the reader need it for the odd chapter or two.A thrilling and greatly paced read, H.AL.F The Makers Book 2 is a thoroughly recommended sci-fi read for both Y/A and adult readers! **Once again, thank you to author Natalie Wright for the opportunity to read and review**The Makers is the sequel to The Deep Beneath. It picks up where the first story left off, and boy, does it get crazy in this one.Erika, Ian, Dr. Randall, and Tex (aka H.A.L.F. 9) are stuck. Completely and utterly stuck on an alien spaceship with no idea how, when, or if they'll be able to get home.Jack, on the other hand, is now stuck putting his trust in one of Commander Sturgis's lackeys, Sewell. He's sent into "hiding" with Commander Sturgis's niece, Anna. He's also given a task he really doesn't want to commit to, but the promise of being able to go home again is enough to at least motivate him to try and follow through. He definitely can't anticipate the awfulness he's about to face, though. If he thought Commander Sturgis was bad, he's in for a rude awakening when he meets the man in charge, William Croft. I don't know if I can even put into words how awesome this book was. Honestly. There's so much going on, and it switches between what Jack and Anna are struggling to do, and what Erika, Ian, and the others are faced with. To be honest, I think the latter group had it so much worse. Tex has been taken away from Erika by the Conexus, a group of aliens (also known as Greys) who have a hive mind. They're all interconnected to each other, and to everything around them. It's kind of insane. The Regina, the head of the Conexus, wants Tex to meld with them and become one with them. She'll do anything to get him to give up his humanity and his budding friendship with the others and make him a full-blown alien. Erika and Ian, on the other hand, are trapped in a room, guarded only by a very easily manipulated Infractus (aka someone like Tex). Unfortunately for all of them, the Conexus doesn't take kindly to what they've been getting up to. Xenos, their guard, is punished, and Erika and Ian are infected with an alien virus. So not good.And, to top it all off, there's another race of aliens that gets introduced, albeit not as in-depth, and they... well, let's just say they make the Conexus look like Disney Princesses.Another fantastic read. The storyline is engaging and hooks the reader from the very beginning. The differing POVs are easy to keep up with, and it makes the book even more exciting. It made me wish the books were movies. That's how good this one was. I found myself changing my opinion of certain characters in this book, although, considering the direction the character arcs went, that happened a lot. One minute I was frustrated and angry with a character, on the verge of hating them, and then I was like, well, they're not bad now, so what do I do? Like them? Continue hating them? It was fun to see how much the characters had changed. The Makers is definitely a thrill ride, and I highly recommend it. Definitely deserving of the five stars I gave it. I read the first book in this series, The Deep Beneath, back in September 2015 and have been eagerly awaiting the next chapter ever since. I'm very happy to say the wait has been well worth it as The Makers is every bit as entertaining.The first thing that got my attention was the pronunciation and definition guide, a tremendous help when you're reading a book involving unfamiliar terms and language. Will I remember any of it? No, of course not, or at least not much, but it certainly enhanced my enjoyment of the story not to have to try to remember all these details and foreign words. Actually, I probably will retain a few things, like "manthruin" which is a spice similar to our own cinnamon; I love cinnamon so I'm intrigued by this alien spice. I'll also remember "mach" because it's always useful to know how to ask for a toilet ;-)Sometimes, we discover that the things we know are not much like reality and Erika has certainly had to cope with a lot of reality since first encountering aliens but being in servitude to the aliens is definitely not what she and Ian want for their future. Unfortunately, their options are limited since they're on an alien spaceship heading to....somewhere. Meanwhile, back at the ranch (so to speak), Jack was left behind on Earth and needs help from Dr. Sturgiss, not his favorite scientist, if he wants to remain alive and free. Meanwhile, Tex, a created hybrid alien/human, has to stay out of the hands of the aliens if he wants to retain his human side, his emotions.Ms. Wright has worldbuilding down pat, creating an alien society and diverse people trying to fight off their control in a story that's very plot-driven and completely engaging. At the same time, a plethora of characters that could be kind of overwhelming are anything but as the author has managed to make even peripheral players come to life. The aliens are referred to as "greys" and that can also be seen as a descriptor for the lack of a black and white clarity; all humans are not good and all aliens are not evil.I've become quite fond of Erika and Jack and Tex and all the others and the H.A.L.F. series is an example of how adventurous and fun science fiction can be. The third and final book will be out in 2017 and I'm really looking forward to it. Audiobook review: The story picks up where the last left off with Erika & her best friend in an alien ship along with Tex and the Doc. Unfortunately things aren’t as Tex had hoped for. Jack makes a deal to save his life all while hoping to meet up with Erika again someday. The listener is taken on a roller coaster ride of unfortunate situations all while being entertained. The story is well crafted and the characters are likable. My only gripe is the narration. I liked Mr. White’s voice but the quality of the recording was less than acceptable. There are parts where his “s”’s make the speakers screech because he’s to close to the mic and other areas where I had to keep turning up my car stereo because it sounded like his voice was fading. It’s not my phone or car stereo because the next Book didn’t have any problems.I received a free copy of this audiobook at my request and have voluntarily left this review. I'm really enjoying this series and this book kept me hooked. There were several twists that seemed to come out of no where and I loved how unpredictable it was.The complexity of the first book is continued in this one, it's not hard to follow, it just shows that a lot of planning has gone into this series.I can't wait to know what is going to happen next so book 3 is the next book I'm listening to.The narration is great, the character voices are really well done and the delivery is dynamic and engaging.I received a free copy of this book from the author and/or narrator and/or publisher and I voluntarily wrote this honest review. *thank you to Natalie Wright for a copy of this book in exchange for an honest review*3.5 stars.Im really getting into this series now and im so glad about it. Its bringing back my sci-fi love as this is all you can hope for in a sci fi novel. Im enjoying the characters ad the settings, its all just really good! Book 2 of the series. Not bad, but definitely different from the first. The author delves quite deep into aliens and time travel. Erika and Ian have been taken by the greys. They have been infected by a virus and have to find the antidote. Tex has caught the eye of the alien queen. She is showing him how compatible they would be together as long as his human side disappears. And Jack has been left on Earth. With the greys attacking it is up to him to protect those that held him against his will. There is a lot happening in this story. But it is not that hard to keep up with the different characters. I love how the chapters have each person’s name so you could follow along. There is a lot of action and some great fight scenes and what would you expect from a race of aliens that would rather eat us than help us.I loved this book but I do recommend starting this series with book 1, H.A.L.F. : The Deep Beneath. It did take me a little to catch up to the story but I will say that the glossary in the beginning did help.If you want a great alien story that will keep you reading into the wee hours of the morning, look no further. This is a great book. Now I’m going to read The Deep Beneath to get caught up. I received H.A.L.F. : The Makers for free from Sage’s Blog Tours in exchange for an honest review. H.A.L.F. : The Makers is great! I really enjoyed this science fiction book which is a biggie for me because I don't usually favor science fiction books. I was surprised by the author's writing style. Just some of the words that Ms. Wright used captivated me. I also loved the pace of the book, sometimes I think science fiction books tend to drag on a bit. The characters in H.A.L.F. : The Makers are great. I liked the point of view change. It worked very well with the story. All the characters were developed eloquently. My favorite thing about H.A.L.F. : The Makers is probably the dictionary at the beginning of the language. I did laugh a little when I saw she had a word for toilet. That is pretty awesome to me because that shows that the author purposely put a lot of detail into the book.Overall I would give H.A.L.F. : The Makers five stars! I would recommend this book to ALL science fiction readers and to anyone that loves a great book. Like seriously, even if you aren't into this particular genre, you'll dig it! I won this in a giveaway but I couldn't start the second book without reading the first so I went and bought it and I'm happy I did so. I have a weakness for science fiction and young adult science fiction is so convenient. I read this book in a day and it was a good read, great thriller with some interesting twists. I'll make sure to keep an eye out for this authors upcoming books and I will have to complete this series.